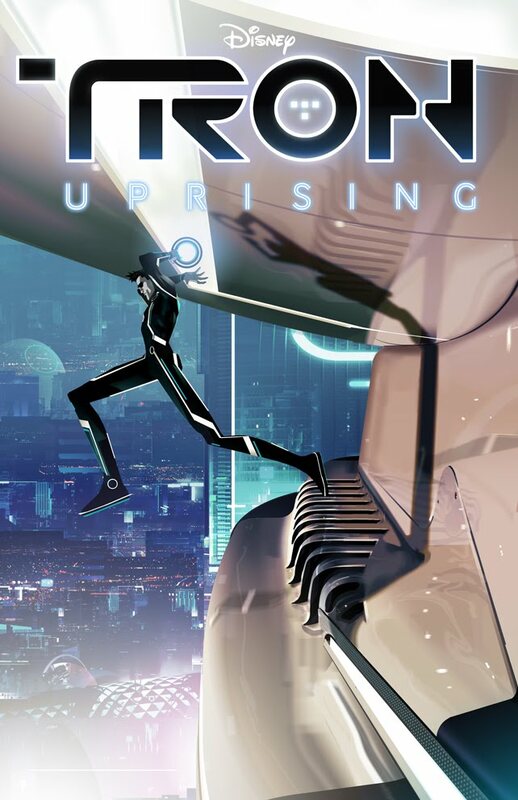 I´m really excited as Tron Uprising is looking really beautiful. My art team it´s amazing and I want to thank to ALL of them for producing such a peculiar and incredible artwork. With all of them I´ve been learning as hell and I feel my painting skills did grow so much by just revising and checking their artworks. I would love to show something here, BUT as you must know Mickey Mouse wouldn´t be happy. So we better wait. However, I can show this poster i did some time ago for Comic Con. Meanwhile...We still working on the series. I hope you all like it or I kill you. I am beyond looking forward to this show. I was covering that Comic Con presentation (which had far too little Tron: Uprising!) and happily walked away with one of these posters. Great work. Can't wait to see it all in the coming months. It's been an unreal experience working with you Alberto and the rest of the team. I'm so excited and lucky to be a part of this team, thank you for everything!!!! Sounds fantastic, can't wait to see it! Madre mía que empacho de talento! Looking forward to seeing what comes out of this insane bunch put together. what a festival of talent and genius. Thanks Boss. Yeah we are a hell good team and we are so flattered. Thanks for the curtain-call and the very best of luck with the remaining production. It's been a great experience and having respected your work for so long, it was an honor and a pleasure. Thanks for everything, and I will echo Vaughan and also say that I was extremely fortunate to be part of the team. You've changed the way I paint!! Thanks for everything! Master, I have learned quite a considerable amount from you and the whole team. I can't wait to see the show when it is finished since it is already looking amazing! Thanks so much Alberto!!! Thanks guys! You are great. Great team no doubt !! Such impressive artist ,i can 't wait to see the film! thanks for the nice mention Alberto. It really means a lot coming from you, and artist I admire and am so inspired by. It was my pleasure to get an opportunity to meet and work for you. Can't wait to see the show — cheers! I´m afraid NO... very unfortunately. Buah! que peña más top, unos máquinas todos. As the team is so international, are you all sat in the same room or is everything done down the wire? Probably a stupid question. El equipo es muy bueno, si... pero tu ilustración es cojonuda!!! me encanta la composición! Increible EQUIPAZO!!!!! Enhorabuena Alberto, que ganas de ver el resultado final, ojala pudierais sacar un magnifico libro de "Art of" bien cargaito de buen Arte, madre mía Mullins, Ruppel, y los otros que jamas había oído/ visto nada de ellos, así pues gracias por presentarlos en sociedad, son verdaderamente fueras de serie, que pasada trabajar con esos talentos. Menudo EQUIPAZO! A ver si hay suerte y podemos ver un artbook de la serie. Just caught the show! Awesome awesome job to you and your team! Great show, unfortunatly here in south america not aired yet (and have doubts about if they will), the best artistic team and story, theres still a lot to tell about the grid.